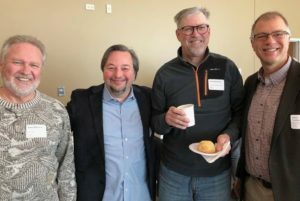 After its final 2018 event in November focusing on the Greenest Region Compact, the Fox Valley Sustainability Network is building momentum with more events planned for 2019. The first forum in early February focused on solar energy and the Future Energy Jobs Act and engaged participants across every sector including developers, municipalities, energy providers, and concerned residents. The next forum focuses on green infrastructure and is planned for March 20 in St. Charles at Midwest Groundcovers. Speakers from the Village of Algonquin, The Conservation Foundation, and Morton Arboretum will discuss various green infrastructure programs and how they can be funded and profitable, and speakers from the Village of Montgomery and Conservation Design Forum will provide case studies of green infrastructure in action in the Fox Valley region. You can register for this event here. Stay tuned for more forums planned later this year exploring other sustainability efforts in the Fox Valley!